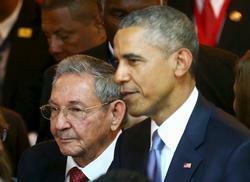 Equipo Nizkor - Obama and Raúl Castro Meet in Important Step of Thaw in Cuba Relations. President Obama and President Raúl Castro of Cuba met here Saturday, in the first face-to-face discussion between the leaders of the two countries in a half century. The meeting on the sidelines of the Summit of the Americas was an important step for Mr. Obama as he seeks to ease tensions with Cuba and defuse a generations-old dispute that has also affected relations with the countries of the region. Ever since his first foray to the summit three months after taking office, Mr. Obama has seen one bone of contention frustrate his efforts to reach out to America's hemispheric neighbors: the fact that Cuba was blackballed from the gathering. He was scolded by Argentina's president for maintaining an "anachronistic blockade," lectured by Bolivia's president about behaving "like a dictatorship," and, in 2012, blamed for the failure of leaders to agree that year on a joint declaration -- the result, his Colombian host said, of the dispute over Cuba. This year, Mr. Obama came to the summit meeting here determined to change the dynamic with a series of overtures to Cuba. In addition to the meeting with Mr. Castro, the summit was the first time in the more than 20-year history of the summit meeting that Cuba was allowed to attend. And it came as Mr. Obama neared a decision to remove Cuba from a list of state sponsors of terrorism, a crucial precursor to the establishment of diplomatic relations between Washington and Havana. "The United States will not be imprisoned by the past -- we're looking to the future," Mr. Obama said of his approach to Cuba at the summit meeting's first plenary session on Saturday, speaking just before Mr. Castro took the floor and before their meeting. "I'm not interested in having battles that frankly started before I was born." He said the shift in policy would be a turning point for the entire region. If Mr. Obama was ready to forget past grudges, Mr. Castro was not. He gave a lengthy speech on Saturday that included a recitation of Cuban grievances against the United States -- including its support for Fulgencio Batista, the Bay of Pigs invasion and its opening of the prison at Guantánamo Bay -- sometimes pounding the table for emphasis. But Mr. Castro also made clear that he did not blame Mr. Obama for the legacy of bad blood between their two countries, and expressed admiration for the American president, calling him an "honest man" and praising as a "positive step" his reconsideration of Cuba's designation as a state sponsor of terrorism. For Mr. Obama, the gathering was a chance to showcase progress toward a goal he aspired to during the first Latin American summit meeting he attended -- when he spoke of a "new beginning" with Cuba even in its absence -- and to clear away what had become a dysfunctional subtext of the meeting for generations of American presidents. "Our Cuba policy, instead of isolating Cuba, was isolating the United States in our own backyard," said Benjamin J. Rhodes, Mr. Obama's deputy national security adviser for strategic communications. "This time, we arrived here, yes, certainly not agreeing with everybody on everything," he said, but with "broad agreement with the leaders here that what the president did was the right thing." While several Latin American nations have criticized recent United States sanctions against several Venezuelan officials it has accused of human rights violations, Mr. Obama's overtures to Cuba, as well as his recent executive action on immigration, to make it easier for some people who are in the United States without authorization to stay legally, have brought an unusual round of salutes and congratulations. "President Obama is going to leave a legacy the way he is supporting Hispanics in the United States, and also his new policy for Cuba for us is very important," President Juan Carlos Varela of Panama said just before a meeting with Mr. Obama at the summit conference. "The Cuba situation has been an obstacle going back a long time in the relations of the United States with Latin America and the Caribbean, and without that obstacle the cooperation on many fronts will be more fluid," he told the Colombian newspaper El Tiempo days before arriving here. "I think it will generate new milestones in the history of all America," President Enrique Peña Nieto of Mexico said just after landing here, adding that he hoped for "more brotherhood, more closeness" in the region. It was a far cry from the last Summit of the Americas in 2012 in Cartagena, Colombia -- marred by a prostitution scandal involving Secret Service agents -- when some Latin American leaders openly berated Mr. Obama for the United States' stance on excluding Cuba, and Bolivia, Nicaragua and Venezuela said they wouldn't attend again unless Cuba could. "Sometimes those controversies date back to before I was born," Mr. Obama said in his closing news conference, adding that it felt at times as if "we're caught in a time warp, going back to the 1950s, and gunboat diplomacy, and 'Yanquis' and the Cold War, and this and that and the other." This time, Mr. Obama cast himself as the agent of change instead of the victim of inertia. "As you work for change, the United States will stand up alongside you every step of the way," he told Latin American leaders and civil society representatives at a forum on Friday. "The days in which our agenda in this hemisphere so often presumed that the United States could meddle with impunity -- those days are past." The meeting was not without tension or reminders of the old animosities Mr. Obama is seeking to defuse. It was marred by several clashes in the streets between Cuban dissidents and government representatives, one of whom accused the demonstrators of being paid by foreign governments, including the United States. "It opens the door for the U.S. government by removing this argument that has been a pretext and an issue that has been invoked, not only by Cuba but other countries in the region, as a distraction," said José Miguel Vivanco, the director of the Latin America program at Human Rights Watch, who attended a round-table discussion of civil society leaders with Mr. Obama on Friday. Latin America's often wary eye on the United States goes back even to what historians consider a precursor to today's regional summit meetings, a congress the South American independence hero Simón Bolivar called in Panama in 1826 among a handful of newly independent countries. They were suspicious of the United States then and of whether, after throwing off the influence of Spain, the new nations would have to contend with a new dominant power. Periodic American intervention, coup orchestrations and outright invasions followed and heightened the region's sensitivity to sovereignty, which continues to this day and often trumps all other concerns. In recent decades democracy has taken root. Anti-Americanism often plays well to domestic politics. And although the United States remains a major if not the top trading partner to most of the region, the economies of Latin American nations have diversified to be less reliant on aid. "Latin Americans are in stronger positions, as the result of more stable democratic governments and more sustainable macroeconomic policies and a surer sense of their national interests, which do not always coincide with those of the U.S.," said Richard Feinberg, an international political economist at the University of California, San Diego, who is attending the summit meeting.